I never get tired of watching horses interact with one another. There’s a grace, dignity, reverence and awareness in their actions that, for me, verges on the spiritual. My heart is lifted and my head is light as I gaze upon their beauty and embrace the moment with them. In this instance, my Bear (foreground), is in the process of getting to know new herd mate, Midas. This image was taken in the spring about 10 minutes into their initial meeting. Already, after a few snorts and squeals, stomping of feet as nostril meets nostril, breath meets breath, and a short tour of the paddock together, Bear and Midas have made their peace and are sharing a snacking moment. I love how their heads pressed together side by side give the impression of a heart. To me that’s what these spirited animals are all about ~ they’re all heart. 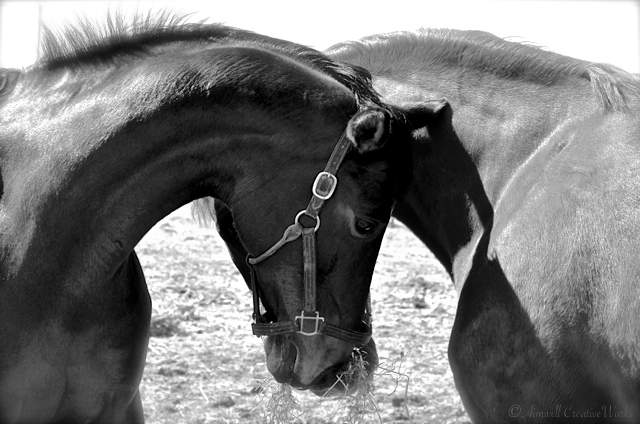 This entry was posted in Animals, Equestrian, Nature, Photography, Uncategorized and tagged Aimwell CreativeWorks, black and white, Dorothy Chiotti, Equestrian, Equine image, heart, Horses, Light and shadow, monochrome, Photography, spring. Bookmark the permalink. This is just so beautiful! Sometimes I wonder if they have an inaudible language ?